The world’s largest turbine–a 130-ton, metal shaft with twin rotating blades–is making its way on a barge from Invergordon, Scotland to the European Marine Energy Centre test site off the coast of Orkney. Tidal power will get its biggest test this summer. The world’s largest turbine–a 130-ton, metal shaft with twin rotating blades–is making its way on a barge from Invergordon, Scotland to the European Marine Energy Centre test site off the coast of Orkney. Installers will then battle 50-foot waves and an average temperature of 11 degrees to install the turbine and connect it to the electrical grid. The scale and timing are significant. For one thing, it’s the biggest installation ever planned. Dubbed the AK-1000, the turbine took Atlantis Resources Corp. $7.5 million and a decade to complete. 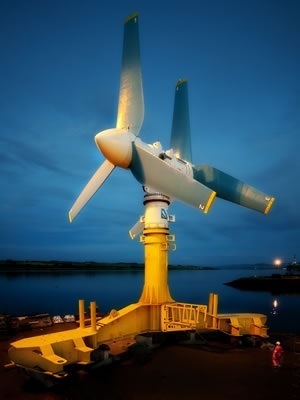 Functioning like an underwater windmill, the turbine will generate 1 MW of power immediately, or enough electricity to power 1,000 homes in Scotland. Plans call to expand operations to 150 MW by 2013 and reach 700MW capacity by 2020. Secondly, the installation (if indeed they’re able to beat the elements) would be a huge boost to marine energy advocates. Embraced as a renewable energy option since the ’70s, harnessing marine energy remains a major technological challenge. Spots with the strongest waves and currents are the ideal locations to install equipment–making installation extremely difficult, even in the best weather conditions. Add in maintenance issues and you get a lot of decision makers making other choices. PG&E’s hardly alone in focusing on other options. The United States has just a handful of active marine energy projects, including one using wave buoys in Hawaii and another using tidal turbines in New York City’s East River. Even with more generous government subsidies, robust VC investment, and the European Marine Energy Centre to help coordinate and test efforts, Europe’s not that much farther ahead. Some half dozen projects are operational (although not commercially viable on a large scale) and another 20 or so are still in development or pending. Cleantech analyst Federica Dalamel attributes the slow adoption to the newness of the technology. That said, there’s still huge potential. If those four technologies ever became commercially viable on a large scale, they have a combined energy potential to produce six times the world’s energy consumption, according to Dalamel. Spinning up the AK-1000 would be a big, first step toward that. Let’s see what the Scots can do this summer.